Please click on the + sign or the section title to see the section below. Flooding or Water Damage causes building materials and furnishings to get wet. Promptly remove standing water and all porous wet materials such as carpeting, saturated wallboard (sheetrock) and upholstered furniture from the home. Aggressively ventilate the home to dissipate moisture by opening windows and using fans, if available. Dehumidifiers are useful in enclosed areas or when windows need to be closed because of rain or high humidity. Clean mold from small areas on hard surfaces, such as wood or concrete, by scrubbing the area with a cleaning rag wetted with diluted detergent. Rubber gloves and a dust mask can be used to minimize direct exposure to contaminants and cleaning products. Discard porous materials such as drywall, carpeting, upholstered furniture and ceiling tiles with extensive mold growth. Check routinely for new mold growth or signs of moisture that may indicate the need for cleanup, home repair, or removal of affected materials. A mold problem can usually be seen or smelled. Mold growth may often appear as slightly furry, discolored, or slimy patches that increase in size as they grow. Molds also produce a musty odor that may be the first indication of a problem. The best way to find mold is to examine areas for visible signs of mold growth or water staining, or follow your nose to the source of the odor. Be careful when using household cleaners or disinfectant products. Read and follow all label directions and warning labels before mixing any products. Mixing some products (for example, products containing ammonia and bleach) can create hazardous fumes. Keep children away from both cleaning products and areas where mold is present. Individuals with known mold allergies or asthma should not clean or remove mold, as their condition may be aggravated. If you live in Rochester, NY area or Upstate New York, call A-Plus Cleaning and Restoration 585-325-3000 – we are ready to help you. If the video isn’t showing, please reload the page. Every Flood or Water Damage situation is different. Carpet restoration can begin if the water that caused the damage was either sanitary or unsanitary. If the damage was caused by the black water, the carpeting must be discarded. As long as carpet has not been wet for longer than 48 hours, and the water involved was not sewage based, you can usually save the carpet; however, if the water has soaked for longer, then your carpet is probably irreparable and will have to be replaced. In most cases the padding under the carpet must be replaced as it can’t be properly cleaned and dried. You can attempt to clean the carpet yourself only if the water damage was caused by sanitary, or clean water. Take the wet carpet outside if possible. If taking it outside isn’t possible, lift it off the floor and tear off the padding. Obviously, if the water damage is extensive you are much better off contacting Water Damage Restoration professionals like A-Plus Cleaning if you live in Rochester, NY or Upstate New York area. A certified professional company will not only ensure that the drying process is fast, and that the possibility of harmful mold growth is minimized, but they will also help you to deal with insurance company to make sure your insurance claim is submitted and processed correctly. To learn more about Carpet Water Damage click HERE. We are ready to help you clean, dry and restore your water damaged carpet and property. Hardwood floors and water don’t mix well together and when hardwood floors are covered by water due to flooding, water damage to the wood could be significant. The floor gets warped and stained, the boards lose their shape. If left untreated, the moist wood is a perfect breeding ground for mold. 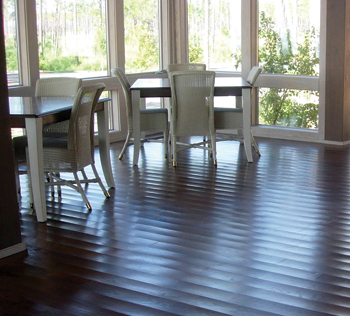 So, how do you treat hardwood floors after the flood? The first step is to remove moisture from the floor if any is still present. You can do this with fans (for better results use powerful industrial size fans), dehumidifiers and other drying methods used above and below the floor. Depending on the degree of the damage, dark stains or cupped floors could be cured by professional Hardwood Flooring companies who could sand and refinish the floors using the right tools. When the floor is buckled, often the best course it to replace it. We are ready to help you dry, clean and arrange to restore or replace your water damaged hardwood floors by one of our trusted partners. What Causes Water Damage To A Ceiling? How long should you wait before making any repairs, to the water damaged ceiling area? Do you have to remove the actual sheetrock/drywall to your damaged ceiling area or can you just let the water dry and patch the ceiling? You see a pucker in the ceiling where the water was – what would cause that kind of damage and can it be fixed without removing the drywall ceiling area? You just see a wet area on the ceiling – how damaged is it and can you repair it right away? The ceiling area is completely and thoroughly dried and cleaned and the possibility of mold growth is significantly reduced. If the water damage to the ceiling is significant, it might require calling water damage restoration professionalswho are equipped not only to repair the ceiling, but most importantly to ensure that there is no water leakage and re-mediate or reduce the possibility of mold growth. If you live in Rochester, NY area or Upstate New York, call A-Plus Cleaning and Restoration 585-325-3000 – we are ready to help. A flood is a covering by water of land not normally covered by water. When your property is filled with damaging water, many wonder if the Insurance will cover the losses. That depends on the type of insurance you chose to purchase and how the water entered your house. There basically are two insurance policies that deal with a homeowner’s damage due to water — a flood insurance policy and a homeowners insurance policy. Only Flood Insurance Will Cover Your Flood Losses. A hailstorm smashes your window, permitting hail and rain free access to your home. A broken water pipe spews water in your home. Even if your homeowners insurance policy doesn’t cover the water or flood damage you’ve experienced, losses from theft, fire or explosion resulting from that damage are covered. For example, if a nearby creek overflows and floods your home, and looters steal some of your possessions after you’ve evacuated the house, the theft would be covered by your homeowners insurance. However, the flood damage would be covered only if you have flood insurance. Ask your insurance agent about your coverage and make sure you are adequately covered for water and flood damage related losses. State Farm Insurance has created this video to share some simple steps that you can take in order to prevent water damage to your home. Check under your sinks for signs of leaks. Most of the time the costliest damage to a property result from invisible wall leaks. Imbalanced duct systems can draw outside humidity through walls. In addition to causing damage to the property, moist air also provides breeding grounds for mold spores. Be sure to service your air conditioner on a regular basis. One of the most frequent problem areas because moisture in the form of dripping or condensation can accumulate through the concrete or stone foundation of your home. The best way to minimize the possibility of water damage through your basement is to waterproof your basement by a professional company that specializes in basement waterproofing. Air leakage between the attic and the house bring moisture into the attic which condenses on the underside of the roof. This can then cause rotting and mold. Maker sure that light fixtures as well as holes for pipes and wires going into your attic are airtight. Take care of leaky attic access points, and exhaust fans venting into the attic. GET 10% OFF Water Damage Restoration Services when you mention that you saw this online ad. I won’t use anyone else. You and your staff were prompt, courteous and professional in dealing with the resident’s health concerns. I would not hesitate to recommend your company to anyone with mold remediation issues.